If it wasn’t for extra magic hours, we would have never gone on Soarin’. It’s been so many years since Soarin’ has opened at Epcot. Being annual passholders we have been to Epcot dozens upon dozens of times, but we hate to wait in lines, who doesn’t. Usually the listed wait time is 90 minutes during regular theme park hours, at least any time we have been over in The Land and checked the wait time, it has said 90 or more minutes wait. We don’t usually use fast passes because you have to get there early enough for the FPs, by the time we get into the park they are usually all gone for the day. During one of our recent trips to Disney, while staying at a Disney resort, we finally took the opportunity to visit Epcot after hours. We still had to wait to get onto Soarin’ but the wait time was about 40 minutes. Something we learned about EMH is that as long as you get to the attraction before closing time, they will let you on. So, if EMH hours is from 9 pm to 12 am at Epcot, if you enter the Soarin’ line at 11:59pm you will get to ride. This can save you a lot of wait time, the lines thin out significantly the closer you get to closing time. Another ride that I got to ride on during EMH was Toy Story Mania at Hollywood Studios. This ride also has long wait times. As I mentioned, we don’t go to the parks early (we aren’t really morning people), so Fast Pass distribution doesn’t help us, but evening Extra Magic Hours does. Toy Story Mania was really awesome, I still had to wait a little, it took about 15 to 20 minutes. I was in the single passenger line, the other line moves slower. This is one of my favorite rides of all time. I really love evening Extra Magic Hours at Magic Kingdom, the more empty the park is the better. It’s awesome to be there with not many people around. The wait time for Peter Pan’s Flight is usually an hour or more during regular park hours – and packed with parents and kids of course. We’ve walked onto Peter Pan’s Flight with no wait before, the closer to closing time the quicker you can get on. Same for Winnie the Pooh, no line. Usually it’s not this empty until the last 15-60 minutes during EMH. Once we were in the Haunted Mansion with only two other guests, that was the least crowded it’s been. Still waiting for it to be just us, that will be awesome. You can always do the less popular rides/shows at the start of EMH, like Tomorrow Land Transit Authority, Carousel of Progress, It’s a Small World, Philharmagic, Country Bear Jamboree, and then do Pirates, Splash Mountain, Space Mountain, Buzz Light Year, Peter Pan, etc. towards the end of EMH. Once we went on 14 attractions in 3 hours, you just can’t beat that. It’s also a great time to play the Sorcerer’s (Magic Card) game. Make sure to keep your Key card handy, they will ask to see it if entering the parks after hours, and they will ask to see it at some of the rides. Also, each member of the group should have their card, they once made a stink about my husband needing to show his card as well at the Haunted Mansion, mine wasn’t good enough for both of us. So to save time searching for the card, it’s best to keep it handy. If you have the chance to stay on Disney property, I highly recommend it. In my opinion, the Extra Magic Hours perk is worth staying at a Disney resort. You can’t beat having all your transportation taken care of as well, that makes thing a lot easier. To me, it just wouldn’t be a vacation unless we were staying at a Disney resort. 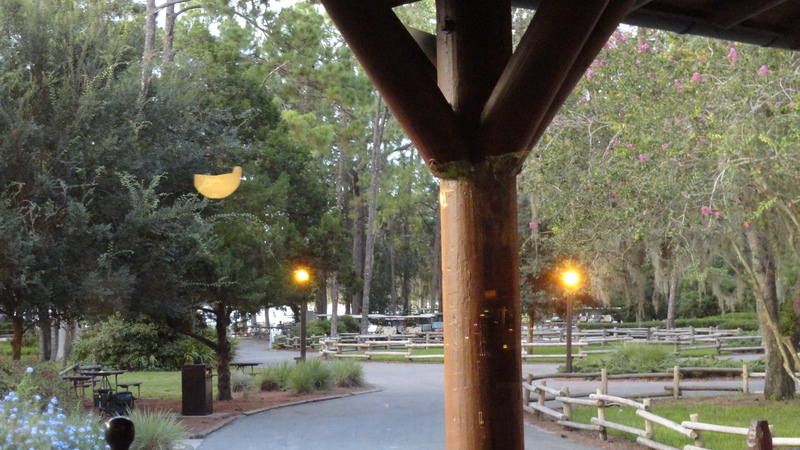 Trail’s End is located at the Fort Wilderness Resort and Campground. If you are not staying at this resort, you have to take bus transportation from your resort or theme park, or if you are driving you will have to park at the front lot of FW and take bus transportation to the settlement area. There are three different color coded buses once you are at the bus terminal at FW, each one will end up at the settlement area where Pioneer Hall is located. There is boat transportation from Wilderness Lodge and the Contemporary. Once you get down to the settlement area it’s a very short walk to the restaurant. Trail’s End is one of the few restaurants that usually do not require advanced reservations. I usually make a reservation in advance just in case, nothing would be worse than heading all the way down there by bus to get turned away. If you ever find yourself in this situation, there is a “Trail’s To Go” counter where you can order off a to go menu and there are several picnic tables just outside. Trail’s End offers an all-you-care-to-eat buffet in addition to an a la carte menu. The buffet at Trail’s End is perhaps the least expensive of all the Disney buffets. For the price it is a great value, if you are looking for good food and a good price with nothing fancy. The theme of the restaurant is rustic/pioneer, drinks are served in mason jars, and the plates and bowls look like they are made aluminum or similar metal, like back in the olden days. I’d like to try their breakfast buffet sometime, they have Mickey Waffles. 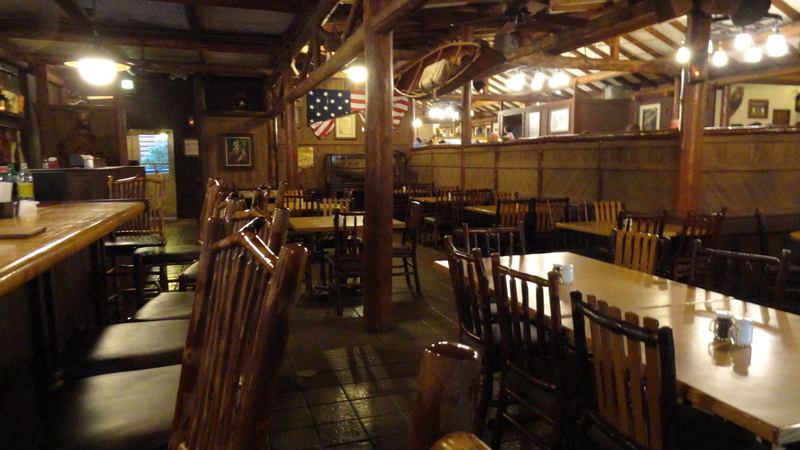 They do have a full bar there (with TVs), called Crockett’s Tavern, there is seating at the bar or you can order from the to go window and enjoy your drinks outside on the rocking chairs or around the settlement area. 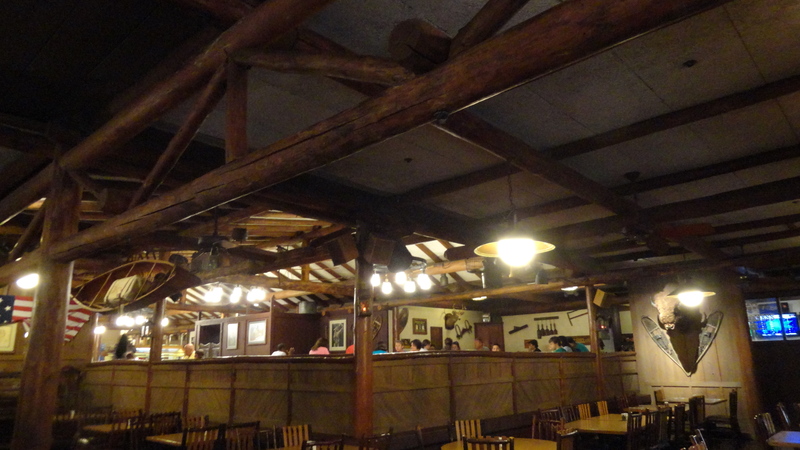 It is a relatively small buffet, compared to Boma for instance, but there is plenty of food to choose from. They have a salad bar, with peel and eat shrimp. Limited fruit selection (usually two – grapes and melon), various cold salads, make your own green salad with dressing. They have a variety of proteins usually there is salmon. They offer a selection of sides: corn, mashed potatoes, mixed vegetables. Full potato bar with toppings; bacon, cheddar, chives, sour cream, butter, etc. They have a soup selection, with chili and the soup of the day. Pizza. A carving station. Pasta with sauces. Cornbread. The desserts are good, cookies, apple cobbler, soft serve, candy toppings for the ice cream. I’ve also seen red velvet cake on the dessert bar and carrot cake, this may alternate daily. Although I haven’t ordered anything a la carte, I would expect that it is the same quality as the food they serve on the buffet. If you are celebrating a special occasion or birthday, they may bring you strawberry shortcake, there was a birthday at the table next to us. If it’s the same strawberry shortcake as they serve at Hoop Dee Doo then you are in for a treat – best strawberry shortcake ever. If you are looking for some entertainment after dinner, check and see if the Chip and Dale campfire movie is playing, or watch the Magic Kingdom fireworks or water parade from the lake shore. Also (for an additional cost) you can hire a horse-drawn carriage ride, or take a ride in the larger wagon for a tour around the area. I’m looking forward to the wagon ride tour, just waiting for the weather to cool down!